What’s the difference between 21% debt to GDP and 59% debt to GDP? One is the reported figure for the State of New Mexico, using creative (Enron-style) accounting and one is accounting using the mark-to-market method. If you aren’t familiar with mark-to-market versus “mark-to-value” it’s sort of like a speed limit. Normally, if you are going 80 MPH, and a cop pulls you over in a 55 MPH zone, he or she will say you were going 25 MPH over the speed limit. That’s mark-to-market. Reality. Imagine if when you were going 80 MPH, you were able to average out the speed of the people around you and compare that to your speed to determine if you were going too fast. Therefore, if you were in a 55 MPH zone, and everyone around you was going an average of 77 MPH, you were only going 3 MPH faster than everyone else and if a cop pulled you over, he didn’t say you were going 25 MPH over the speed limit. He said you were going only 3 MPH over the speed limit, which, in retrospect, not only would probably get thrown out by a judge but probably wouldn’t get you pulled over in the first place. That’s mark-to-value. Essentially, if everyone else is breaking the law, you’re only breaking the law to the degree you break it more than them. At first glance this seems somewhat logical. The problem happens when, for example, everyone decides driving 90 MPH in a school zone is appropriate. If you are going 85 MPH in a school zone, not only are you now not speeding, but you’re actually playing it safe. Currently, if banks marked their assets to market, they’d all be bankrupt, even with the bailout money, so as of last year, they are all allowed to use mark-to-value accounting, which says essentially that banks get to determine themselves what their assets are worth. So, if they have a lot of repossessed houses that would only sell today for half of what they paid for them, they are still worth what they paid for them — not half, because they’ll be worth that someday, and anyway all the other banks say their foreclosed houses are worth the higher amount too. Forget that the value of something is determined by what you could sell it for today, not in a distant future. It would be like if a person could say their stocks, even though selling at $10 today, are really worth $20, because they’ll be worth that someday. Or their stamp collection, while worth $3 now, is really worth $100, because they need only one more stamp to make the collection complete. In other words, not reality. It’s not reality because, naturally, one cannot guarantee the item will be worth more in the future, regardless of any calculated probability. 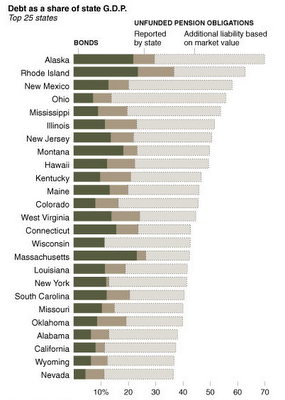 These states are much worse off than the “states” in the EU, such as Greece. Remember that the next time “recovery” is chanted on all the happy media heads. Until now, most people who have negative equity in their houses have paid their mortgage whenever possible, despite it being a terrible business decision. This irrational behavior has been chalked up to the impression that paying a mortgage is like keeping your word of honor. “Loeb said he thinks much of the criticism aimed at homeowners who default is based on a poor understanding of what a contract is. A contract is nothing but a legally binding agreement between parties with competing interests that sets forth mutually acceptable terms for their interaction. Loeb said every mortgage loan agreement includes default and home repossession as a possible outcome. ‘If you stop making payments, you’re not breaching the contract, because default and foreclosure are valid means of fulfilling the contract,’ he said. Well said, New York Times. It’s been years since I’ve read anything in your pages worthwhile. Today’s article of doom: Aw, shucks, I wonder if some of that rally was overdone? Well, it’s 2010. I didn’t post much in 2009 because this blog is about doom only. It’s not my personal life blog. It’s not a blog about inventions or neat stories. It’s solely about doom, and 2009 was the greatest year of doom-hiding fakery I’ve ever seen and plan to ever see in my life. In short, 2009 was one big sham, and it was boring to write about. I think 2010 will be more interesting. While the Dow is at 15 month highs and everywhere you turn there are green shoots sprouting and growing and multiplying like a chia pet on time-elapsed camera, I still remain a pessimist about the whole thing, and here are some reasons why. 1) AIG. Remember the big news that all the major banks had paid back their bailout loans (with interest)? What if I said they paid it back because in addition to the original loan, the government simply gave them cash in secret to pay it off? That’s essentially what happened. Banks that should have lost money on their speculative investments were paid in full by AIG, which means paid in full by the taxpayer, who assumed AIG’s debt obligations. Oh yeah, and our treasury secretary, purposely didn’t want us to know this fact. Check it out. 2) Fanny Mae and Freddy Mac. In addition to the backdoor bailout mentioned above, the government has been covering banks’ losses on crappy real estate bets by buying up “toxic mortgages” through Fanny Mae and Freddy Mac. And apparently $400 billion is not enough. Over Christmas, Obama apparently quietly lifted the limit from $400 billion to infinity going forward as the government once again lets banks make trillions during boom times and then sticks taxpayers with losses during the other times. It’s called privitizing gains and socializing losses, folks. The banks win and you lose. 4) California, and states in general. California’s much publicized “budget balancing” last summer was, in the vein of 2009, a charade. Now it wants $8 billion from the Federal Government because politicians there also won’t cut and won’t tax. And it’s not just California. New York is bankrupt too. Eventually, all states are going to go hat in hand to the Federal Government with the magical money-making machine that can print prosperity. Amazing, that prosperity machine. Why don’t we just print quadrillions of dollars? We’ll be so rich! 5) Emergency Benefits. The government likes to talk about how the unemployment rate is dropping. What they mean is the number of new people signing up for unemployment benefits is dropping, and the amount of people receiving state unemployment benefits is dropping, the latter almost exclusively due to peoples’ benefit time limit running out and them still not having a job. This is easily provable because of a humongous jump in so-called “emergency unemployment benefits” which, conveniently, fall into a different category and aren’t reflected in the official unemployment numbers. For details, read here. All of these stories individually are bad enough, but cumulatively, paint a completely different picture than the silly news networks spin. But then, what can you expect from media, who instead of reporting on the Health Care Debate as a government debt obligation issue (the government has $80 trillion in MediCare and Social Security benefits that are not reflected in the National Debt and knows it can’t afford and is therefore looking at ways to renege on their debts) reports it as a ridiculous philosophical argument between Demublicans. It’s so massive, and gaining such momentum, that we can’t even halt it, much less reverse it. For example, this article mentions, “According to recent estimates, tax revenue from all sources would have to increase by 61% in order to balance the 2010 fiscal budget. Given that State government income tax revenues were down 27.5% in the second quarter, the US government will be lucky just to maintain its currentlevel of tax revenue, let alone increase it.” But don’t worry. When all this is over, it’ll sort itself out, right? Today’s article of doom: The prosperous USA. Unemployment is not better. Nope, not better. Pension funds are not better. Real estate is not better. Oh no, not better. But the banks, boy howdy. They are making a killing. Today’s article of doom: oh yeah, and the government is not better also. As readers of this blog know, I have maintained in previous posts such as this the position that all the bailouts, which were sold to the US under the guise of buying up bad mortgages and then immediately switched out to saving big banks, credit card companies, insurance companies, etc, will fail until the underlying problem of overpriced mortgages is addressed. There will be no economic recovery until either peoples’ mortgages are reduced to reflect the worth of their house, or their housing values recover, because the mortgage is the single biggest expense/investment a family in this country makes. No talk of recovery is meaningful absent this. Lo and behold this article comes out. Wow. Half of US homes will be worth less than is owed on the mortgage by 2011. If this prediction is accurate, that is when the bottom of this depression will occur. Who will continue to faithfully pay their mortage year after year knowing all that money is going down the drain and they could be renting for half as much? How will the banks, absent another series of taxpayer handouts, be able to pretend their mortgage “assets” are worth anything? Despite all the news about the bottom possibly being in we have horrific facts like the fact income tax revenue is down by almost a fifth, the total bailouts could cost $23 trillion, Fanny Mae needs a (third? fourth?) bailout to the tune of another $10 billion, and the market is saying California is seen as having a higher risk of default than Russia, which actually did default 11 years ago. Today’s article of doom: The Iraq and Afghanistan wars, originally estimated at a cost of $50 billion, are hovering around the $3 trillion mark. 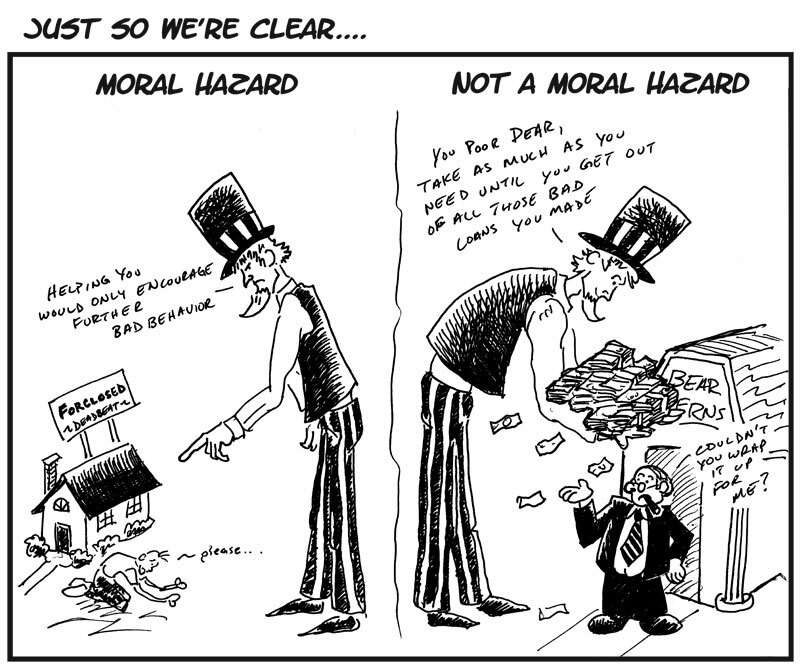 It usually comes as a shock to people – especially diehard Americans who place infinite trust in their sacred Constitution – when they discover that the US dollar is not a product of the American government. That’s right, fellow consumers, that crumpled wad of dollars in your pocket is the product of the U.S. Federal Reserve, and despite the very official title, is about as “federal” as Federal Express. The reality is that the U.S. Federal Reserve is a profit-making venture just like Wal-Mart, General Motors or McDonald’s. It’s really too bad the American people didn’t recognize that nothing, not health care, not carbon emissions, not tax rates, not race relations, not gay rights — not any of the above — is fundamentally important as having a stable economy. Because without that, everything is chaotic, unfunded, unenforceable, irrelevant. And it’s too bad that almost no voters realized the great cancer in our economy; the tumor from which all other tumors arise, is the Federal Reserve. Had they realized this, they would have voted for the one Presidential candidate who ever bothered to talk about the Federal Reserve: Ron Paul. But they didn’t. Some voted for a continuation of a military empire. Some voted for the hopeychange. Hopeychange and military empires both rest on the soundness of economy for implementation, and therefore both are doomed. Fortunately, or unfortunately, depending upon your stance, the fall — at least in this country — may be mercifully sudden. It seems Congress is doing everything possible to throw all the money we don’t even have at all the things that will do nothing to help us. Case in point: billions in foreign aid, billions in loans to the corrupt IMF, and more. Once again the voice of reason is drowned out by the voices of special interest, the voices of goodwill, the voices of the ambitious, the voices of denial. You’ve failed three times in a row, Freddy Mac? Hell, here’s some more billions. To the American citizens: screw you. Get back to work. Long ago, we’ve traded what works for what “sounds nice.” Imagine if a colony of ants. There are fundamental injustices in the ant colony: the workers (all female) are overburdened. The drones (all male) are parasites who offer almost nothing, but eat great amounts of food. The queen is an unelected dictator. However, if you try to correct all those imbalances by forsaking the daily drive to collect food, come winter, every single ant in that colony will be dead. Hope and goodwill are not enough. Perhaps this winter will be enough to convince us. Today’s article of doom: Well, it’s a chart really. When Obama says 10% unemployment, he really means 20%. Why? Because you’re only unemployed if you receive unemployment benefits. If your benefits run out and you still don’t have a job, you’re not unemployed. You’re a “discouraged worker,” a.k.a. deadbeat. If you’re fresh out of school and you can’t find a job, you’re not unemployed, because you were never employed before. If you work only 10 hours a week, you’re also not unemployed. Hell, if you work on commission, and make 10% of what you used to, you’re still not unemployed. Nor are you unemployed if you don’t make money but are in prison, are disabled, etc. Not to mention the figure is adjusted for birth and death rates artificially in the favor of lower unemployment figures. The Average College Degree Costs Roughly $1 Million?! This is, of course, not how the system should be. This is a never-ending version of indentured servitude. And let’s not forget that student debt is one of the very few types of debt out there a person cannot discharge through bankruptcy; the others being taxes owed to the IRS and child support. At the long end of one’s life given the average numbers above, the person without the degree has roughly three times the assets as the higher-earning college graduate. But hey, college isn’t about the ability to make money, right? It’s about the life experience. The $1 million life experience. That is, the life experience that costs $1 million in lost wages and accrual. And it’s worth every penny, right? Right? Does this little chart seem preposterous? Well, check out the details. Dare I say the current educational model is unsustainable? The last time we had something so ridiculously expensive with such easy financing for something so basic to a functioning society was… the housing bubble. Hm. Today’s article of doom: State governments all over the country on the edge of the abyss. And now, the Obama team’s brilliant idea is to give the Federal Reserve sweeping new powers, in tandem with the Treasury, to regulate the banking system. The very ones who were purportedly clueless about what was unfolding, as well as being the ones who caused it (by artificially lowering interest rates to encourage mortgage lending, thereby bypassing the effects of the dot com bubble bursting), are now going to be in charge. After, of course, they engineered the transfer of wealth of the entire future generation to the bottom line of the richest banks. Bravo. It’s like taking the executives from General Motors and then creating a regulatory agency for all motor vehicles and putting them at the helm. In short, it’s absolutely ridiculous. Let’s not forget also, that the Federal Reserve, the organization that controls our money supply, and will soon control the entire regulatory system, is a private corporation. Like “Federal” Express. If you aren’t aware of these factors, I suggest checking out this week’s episode of Freedom Watch, which is one of the very view shows on mainstream TV that talk about these issues. But, since we all know the Federal Reserve has more cumulative power than the US president and his staff, dating back several decades from the point in which the US was arguably effectively bankrupt (though this fact was disguised) and real wealth — gold — was outlawed from public ownership and transferred to pay off international debts and the income tax was established to pay interest on our remaining debts… well, we all know this legislation will pass and the central banks won’t have to rule from the shadows any more. No one wants to be seen as undermining our magical new President’s will, therefore, it will pass. In the words of Kurt Vonnegut: so it goes. Today’s article of doom: political correctness is way out of hand when people are arrested to make up a “fair” quota of racial balance completely at odds with established crime statistics. Soaring deficits, reduced income, over-burdened infrastructure, over-burdened health-care system, mountains of unfunded pension liabilities, a politically-correct atmosphere of entitlement (even among non-citizens), and a populace that wants no new taxes. All of these things define both the Federal Government of the United States and the State of California. There is one crucial difference, however, which assigns the image of green shoots to the former and tumbleweeds to the other. California doesn’t print its own money. Therefore, the state can only spend money it either has or borrows, and no one is stupid enough to lend them anything anymore. Absent this crucial difference, California is a microcosm of the USA. Unfortunately, this difference is unimportant in the long run for the Federal Government, because inflating the currency is not a solution; it’s a delay tactic. So, what can be done for California? Well, cuts need to happen, taxes need to be raised, money needs to be borrowed (courtesy of the Federal Government guaranteeing the debt, like a parent co-signing on their delinquent teenager’s car loan), or the State needs a Federal bailout. In my opinion, each of the four options is equally likely, and probably a combination of all four will be the solution. The cuts needed are mind-boggling, such as eliminating welfare, college funding, and state-funded medical insurance entirely. And closing state parks. And letting people out of prison early. And even eliminating textbooks. Some people are very, very upset. But hey, the populace just shot down an emergency increase in taxes, so what’s the state to do? Obviously, politically pander and beg for handouts from the Federal Government, of course. With all the chains and conditions such funding will inevitably come with. In the meantime, as an angry citizen as you most surely are, you can play with the budget yourself and see how you’d plug the gap with this interactive tool. It’s educational at the very least. Who’d have thought money didn’t just fall out of the sky over Sacramento? 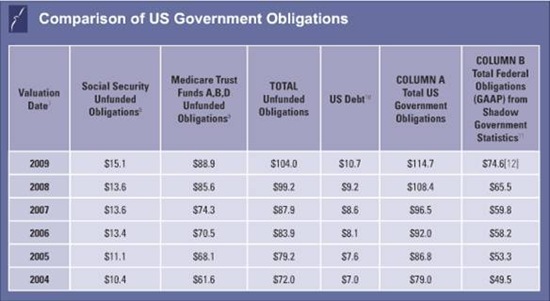 Almost certainly, some amount of money will get passed down from the Obama administration. But keep in mind this fact: the Federal Government is in far worse shape than California. In fact, if California’s debt to GDP ratio was the same as the Federal Government’s, its debt would be 230 billion instead of 25 billion! Today’s article of doom: Idiotic mainstream media tries to link Nazi shooter with people who oppose the Federal Reserve, fiat money (rather than the Gold Standard), and unconstitutional Income Taxes by claiming the United States never existed without them.